Precision Crop Management (PCM) is an agricultural management system that aims to provide to the crop what it needs, when it needs it and where it needs it. It requires the collection of data regarding the crop and the soil and the identification of the changes that occur in the field as time goes by. The aim is to produce the maximum amount and best quality of crop with the lowest cost but also while protecting the environment and making sure that we can continue using these methods in the future. For PCM we require information about the conditions that are stable throughout the season (such as the ability of the field to produce crops - soil fertility), information about the conditions that vary during the season (like nutrient and water availability, pest attacks, moisture, temperature etc.) and also information that is needed to identify the cause of crop yield variability. 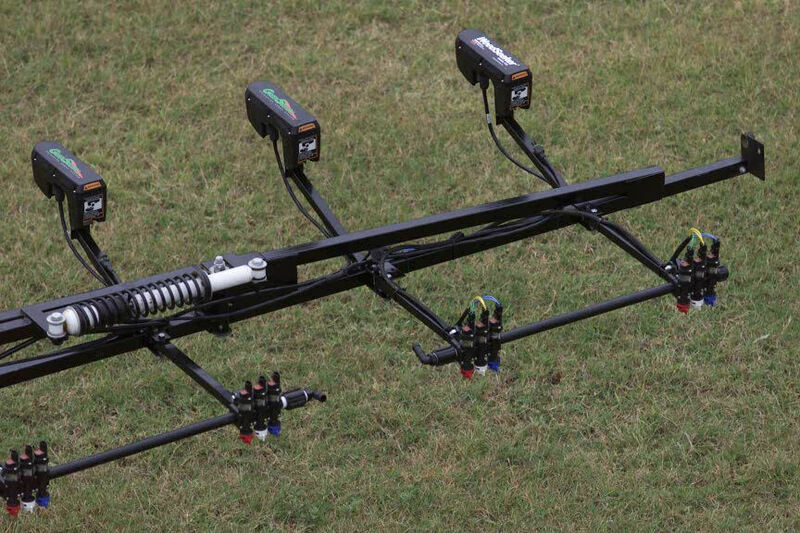 Sensors (top) and variable-rate applicators (bottom) on a combine. The above information can be collected with remote sensing. Collection of spectral data can allow the calculation of indices that give an estimate of the plant condition, or can distinguish the crops plants from weeds. 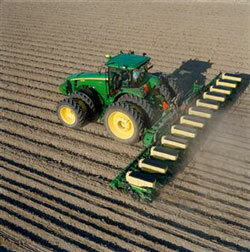 Vegetation and soil moisture or temperature can also be measured by remote sensors that are mounted on a combine. Crop yields can be estimated directly from a vegetation index, or with the use of additional data (moisture, temperature, historic data) can be estimated with the use of complex mathematical models. 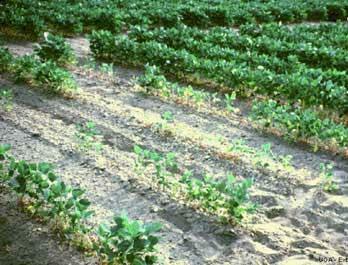 Soybeans stunted by sting nematode infestation. The pest does not affect all plants equally. During the growth season, the monitoring capabilities of the precision crop management system, allows for a prompt identification of any factor that might be out of the ordinary and suggested actions that can be taken to deal with the problem. Lack of nutrients or water at a specific location in the field is dealt with the application of the appropriate fertiliser, or the adjustment of the irrigation scheme. Precision farming can accurately identify the variability and its cause, quantify the variability and its scale, record it and its location and map it so it can be managed. Threats by weeds or attacks by other organisms are identified early and are dealt with at the isolated locations and not in the whole field.